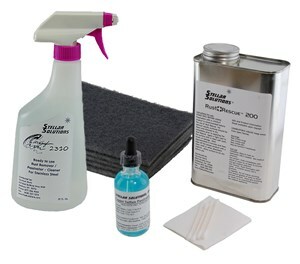 This kit contains a 22oz Container of CitriSurf 2310 conveniently packaged in a spray bottle for easy application. Enough to remove rust from and passivate 50 square feet. CitriSurf 2310 is a gel formulated for cleaning, rust removal and passivation of stainless steel, eliminating free iron from the surface and providing the highest chromium oxide levels possible. To assure best results the areas to be passivated should be cleaned of grease and oils with an appropriate cleaning solution prior to treatment with CitriSurf 2310 solution. Spray, immerse or wipe affected stainless steel with CitriSurf 2310 to completely wet the surface, especially in crevices or in areas where any rust or corrosion may have occurred. The surface must be soaked or left moist for a period of 15-30 minutes at room temperature. After soaking, rinse the surface with clean water. 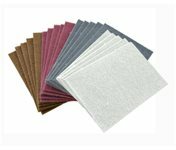 The surface can then be wiped dry with a clean cloth or appropriate absorbent medium. Allow the surface to air dry prior to use. CitriSurf 2310 will not harm the surface of stainless steel appliances or surfaces, and will enhance the brightness when used as directed. Use at full strength. For heavily rusted areas, a five pack of Norton Final Shine Gray Bear-Tex Pads is useful for breaking the rust up during soaking, allowing the CitriSurf to fully penetrate and contact the affected areas for faster, more efficient rust removal. Bear-Tex Pads are non-metallic, so they won't contaminate the stainless steel with rust-causing iron or steel. After removing rust and passivating with CitriSurf, use the Citrisurf Copper Sulfate Test Kit to test for proper passivation. Apply a small amount of Copper Sulfate solution to your surface and let sit for at least 6 minutes. Apply additional solution as needed to keep the surface wet. Then, carefully rinse and air dry the tested area, being careful not to disturb any copper deposits that may be left. If the tested area has a copper (pinkish) residue, the surface has not been properly passivated. No color change to the surface indicates successful passivation. Note that the Copper Sulfate Test Kit is not intended for use on 400 grade Stainless Steel surfaces. The Quart of CitriSurf Rust Rescue 200 provides additional protection against corrosion for up to 200 square feet of stainless steel. It is formulated to penetrate, reaching deep into scratches, pits and crevices, preventing rust from getting started in these vulnerable spots. In environments with heavy exposure to salt or chlorine, or if the stainless steel has previously corroded, the additional layer of chemical protection can greatly enhance the natural rust resistance of stainless steel. After removing any existing rust with CitriSurf and testing for proper passivation, completely dry the stainless steel before applying Rust Rescue 200. Allow the stainless steel to air dry for at least 2 hours after rinsing. The drying time can be shortened by use of heat, for instance from a hair dryer. Mix the Rust Rescue 200 thoroughly by shaking or stirring. Apply a light coat to the surface of the stainless steel using a clean soft cloth, sprayer, brush or roller. Wait approximately 10 minutes and then wipe off the excess. Allow to completely air dry. Rust Rescue 200 is very safe when used properly. It is calcium sulfonate based, and may cause irritation to exposed surfaces of the body for some persons. Rubber or plastic gloves should be worn when applying this product and when wiping it dry.